June | 2010 | ride.hike.eat. Joel was very good about picking out the shows each night. We seem to like the same music, which made it easy for him. :) After all, it is his fault that I like jazz music. :) We saw a few amazing performances that I would like to mention. My most favorite was Stanley Jordan. I have heard his name numerous times but I had no idea how talented he is. He played a solo performance, which was amazing. I was not the only one who thought so. He got a standing ovation after almost every song. If you closed your eyes, you would think that there were 3 people performing, but he was the only one on stage. At one point he was playing the guitar and the piano at the same time, simultaneously playing with one hand on the guitar and with the other on the piano. Just amazing!! 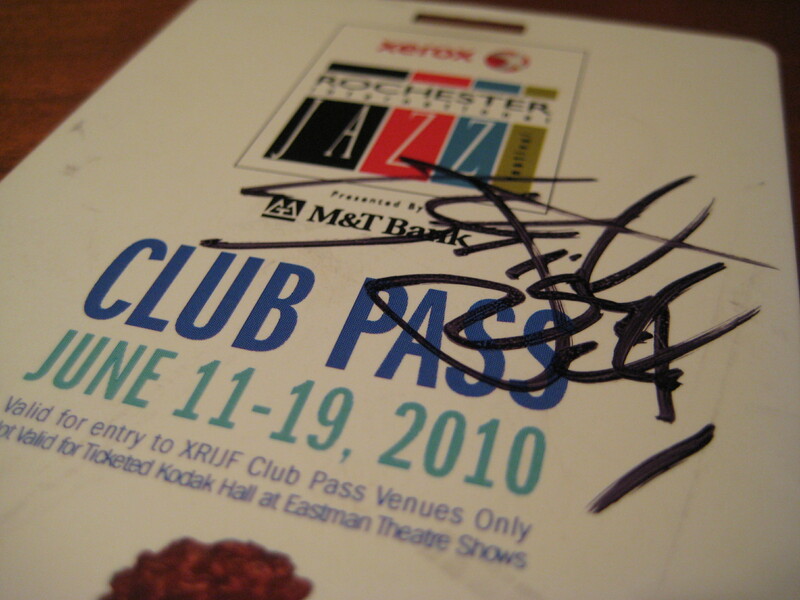 I was lucky enough to shake his hand after the performance and he signed my pass. My next favorite performance was by Charnett Moffett. The standup bass is one of my favorite instruments. He was very creative with his. A favorite song was a Flamenco style song. At the end of the performance, the fire alarm started to go off. The audience was unsure if it was part of the show or if it was going off for a reason. We quickly realized that it was unintentional since he started improving with the alarm’s sound. It was great! Another favorite was Susanna & The Magical Orchestra. Susanna had the most amazing voice. She reminded me a bit of Sinead O’Connor. She performed a few original songs as well as a few songs by AC/DC, Bob Dylan, and others except that she put her own spin on them. My two favorite songs were her rendition of Dollie Parton’s “Jolene” and Leonard Cohen’s “Hallelujah”. I hope to see her again in the future. The rest of my favorite performances were Billy’s Band (a Russian band), Palle Mikkelborg (a Danish musician), and Gwyneth Herbert Quartet (an English band). I would definitely check them out again in the future. The last thing that I would like to mention about the festival is the food. We spent 7 evenings in Java’s Cafe eating their most delicious sandwiches (crazy, no? But they are that good!). Not only do they have great sandwiches, but they also have great drinks and some very enthusiastic waitresses. I would be enthusiastic too if I was selling those sandwiches. :) In fact, the girl behind the sandwich counter remembered us from last year. How great is that!! I truly enjoyed the festival, but at the same time I was getting a bit tired towards the end of the week. I do look forward to next year’s festival though.